NY: Knopf, 1964. First revised and enlarged edition, third prnt. First published in 1945. Full cloth. 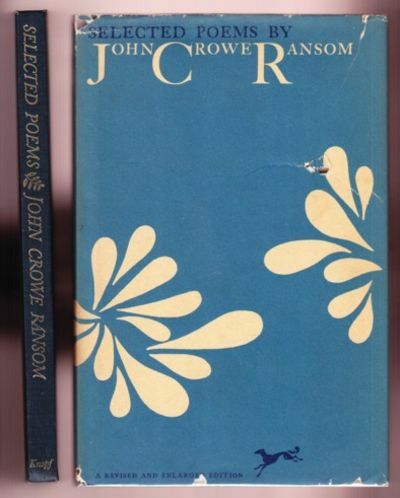 Signed and dated "Dec 27/66" by Ransom on the blank reverse of the announcement page which lists new titles from the publisher. Above his signature Ransom has written, "Most cordially!" Just a touch of shelfwear, mostly at the spine tips; dustjacket with a small perforation and one and a half inch closed tear on the front panel, chipping on the edges, mostly the bottom edge and spine ends; otherwise, clean and intact. Near Fine condition in a Good dustjacket with an archival cover.. Signed & Dated by Author. Hardcovers. 8vo - over 7¾" - 9¾" tall.